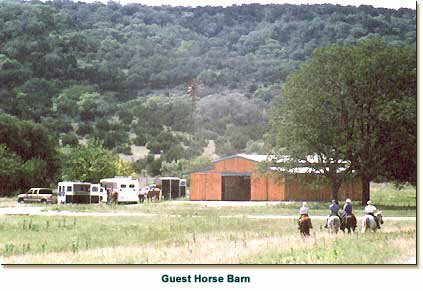 Guest Horse Boarding and First Class Accommodations! For guests who choose to bring their own horses with them, Hill Country Equestrian Lodge provides the highest quality overnight boarding. Our cedar barn features 12 x 12 stalls with automatic fly spray system, automatic waterers, and lots of natural light and ventilation, thanks to its raised center aisle design. Upon arriving, guests find their horses' stalls clean and freshly bedded. 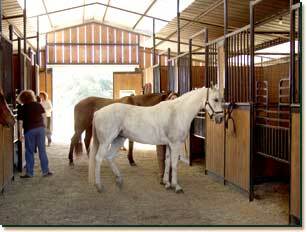 Stalls are picked daily and bedding replenished as needed throughout the horses' stay. Guests need only bring feed, hay, a feed bucket with hook, and, of course tack and grooming equiment. The Lodge's covered round training pen and split-rail riding arena are also available for guests' use. 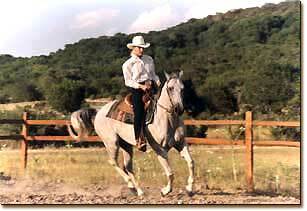 And since the ranch has its own private entrance to Hill Country State Natural Area just steps from the barn, guests enjoy ride-in, ride-out access to about 6000 acres and 40 miles of trails without ever hooking up to a trailer.